Contemporary lines intersperse the frame of this upholstered, dining room arm chair, creating a look of chic contemporary fashion that features a soft and traditional aura. An upholstered piece designed to decorate dining rooms in a high end fashion, this cosmopolitan piece is crafted from an exposed wood frame with visible wood legs and a traditional picture frame back. Tight pulled upholstery adorns the seat, back and arms of this chair, creating a soft place to sit throughout dinner or conversation hours. Complete with welt cord trim bordering the seam edges, this upholstered piece will bring homes a modern ambiance with a traditional charm. This chair coordinates with an assortment of room styles that can be used as a dining chair or a living room accent piece. 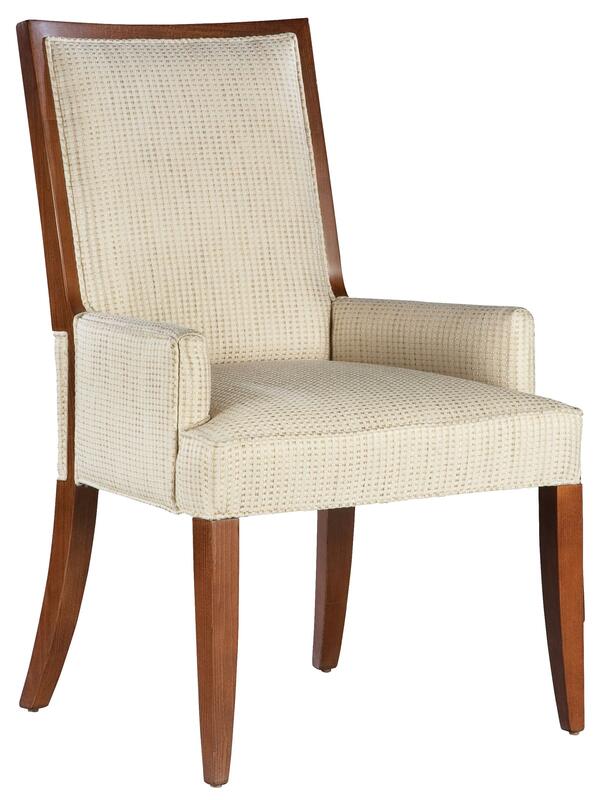 The Fairfield Dining Chairs Contemporary Dining Room Arm Chair with Exposed Wood Accents by Fairfield at Lindy's Furniture Company in the Hickory, Connelly Springs, Morganton, Lenoir area. Product availability may vary. Contact us for the most current availability on this product. Finish Available in over 25 finishes in the following groups: Premium Plus Finishes, Premium Finishes and Standard Finishes. Since differences in wood grain affect the finish, it is not possible to guarantee an exact match between two pieces of furniture. A certain degree of variation should be expected. Dressing up a dining room can be as important to the interior style of a home as the fine upholstery found in most high end living rooms. With eclectic styles ranging from soft and traditional to crisp and contemporary, this dining chair collection exhibits the ability to provide fine upholstered class to any seating or eating arrangement. Whether you are looking to finalize a formal dining space or complete a kitchen nook, this collection will correspond to homes with a fresh and original charm. This collection consists of dining room arm chairs and dining rooms side chairs, many of which can also be used as accent seating in living rooms, foyers, dens and spare bedrooms. The Fairfield Dining Chairs collection is a great option if you are looking for furniture in the Hickory, Connelly Springs, Morganton, Lenoir area. Browse other items in the Fairfield Dining Chairs collection from Lindy's Furniture Company in the Hickory, Connelly Springs, Morganton, Lenoir area.